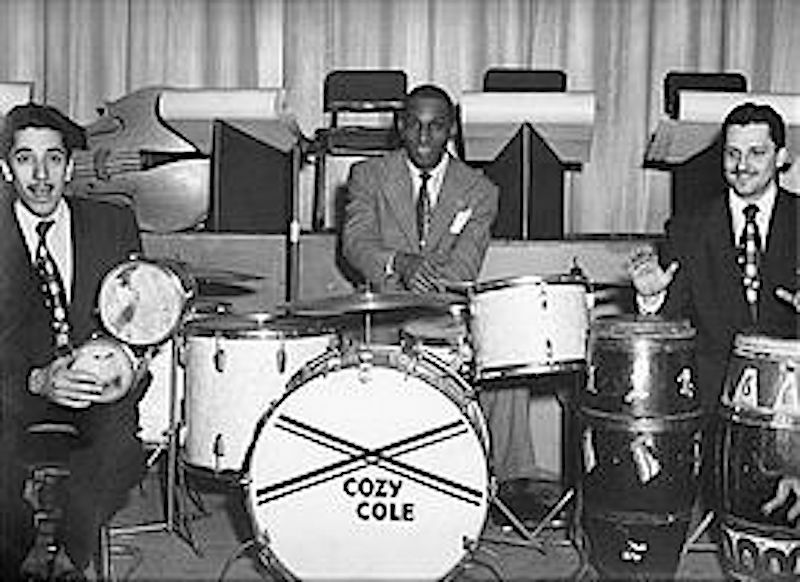 ‘Cozy’ Cole was born on October 17th, 1909 in Orange, New Jersey and since his three brothers were jazz musicians it was inevitable he’d become one too – especially since his brother Herbie was also a drummer. After a couple of years at Wilberforce University in Ohio, 1926 saw Cozy move just over a half an hour’s drive away from his old home in Orange to New York City. 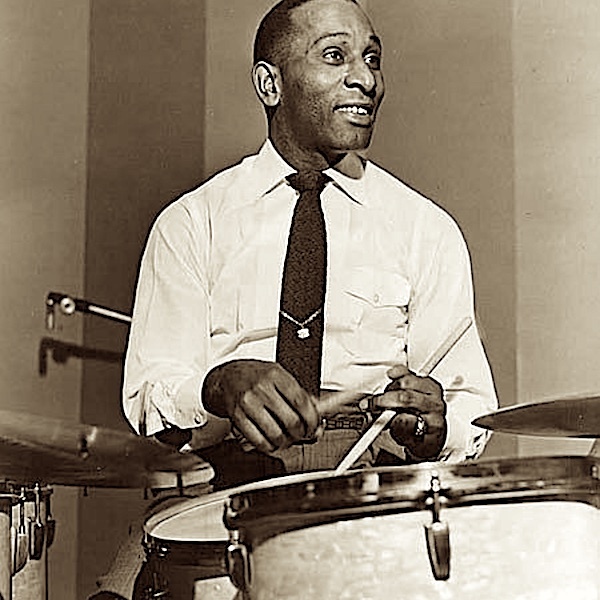 Once he arrived there, like many of his contemporaries he became justifiably fascinated by Duke Ellington’s flamboyant virtuoso drummer Sonny Greer. 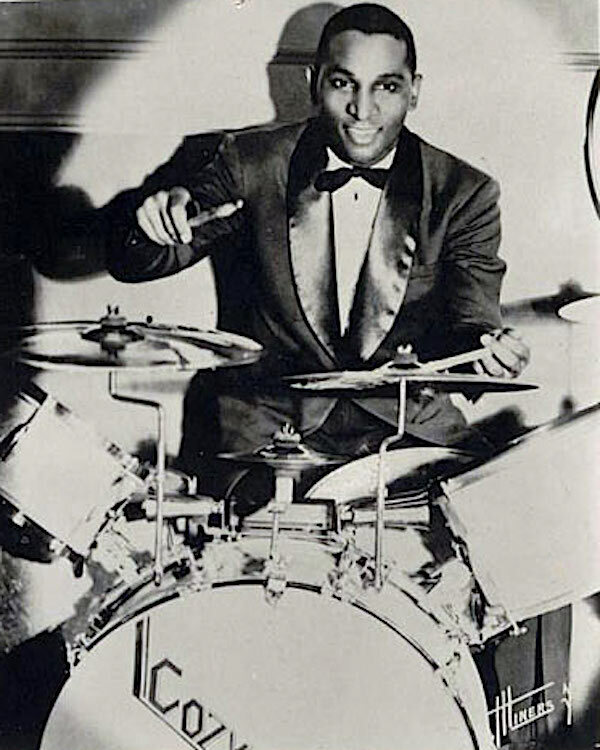 His first ‘pro’ job was with a bandleader called Wilbur Sweatman who was a well known character in and around Harlem. This was in 1928 and by 1930 Cozy was playing with Jelly Roll Morton, and had even recorded a piece named for him called ‘Land of Cole’. He then worked with ‘Blanche Calloway and her Joy Boys’ and Benny Carter’s Orchestra. By this time ‘swing’ music was irresistibly popular and he played with Willy Bryant and Teddy Wilson whilst backing Billie Holliday and Mildred Bailey. 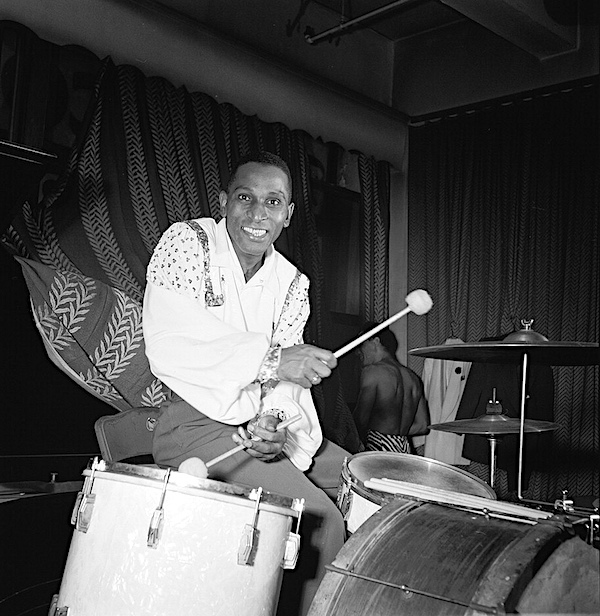 He went on to work with (amongst many others) Henry ‘Red’ Allen, Bunny Berrigan, Bud Freeman, tenor saxophonist Chu Berry, Stuff Smith and Lionel Hampton. At the end of the thirties he was playing with Pete Brown’s Jump Band, Joe Marsala’s Delta Six, Wingy Manone, Duke Ellington and Leonard Feather’s Allstars. By 1940 he was playing with Blanche’s younger brother, Cab Calloway. 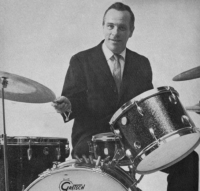 He went on to play drum-orientated tunes with obvious titles like ‘Ratamacue’, ‘Paradiddle’ and ‘Crescendo In Drums’. Continuing in this vein in 1943 he was on Broadway playing ‘Beat Out That Rhythm On A Drum’ in a production of Carmen Jones. He also held down a ‘proper’ musician’s job with the CBS Orchestra which lasted until 1944. Swing was metamorphosing into bop with Cozy’s help and he began to play with Charlie Parker and Dizzy Gillespie. 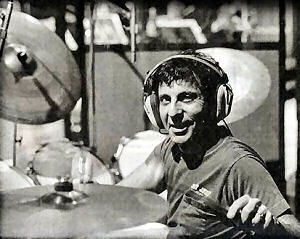 Cozy’s heroes and the guys he wanted to emulate were Krupa, Rich and Bellson, and in the mid-forties he enrolled at New York’s Juilliard School and studied under Saul Goodman of the New York Philharmonic Orchestra. This obcviously went well as a year later he was recording with Benny Goodman, Ella Fitzgerald and Louis Armstrong. He then joined Louis Armstrong’s Allstars for the next four years. 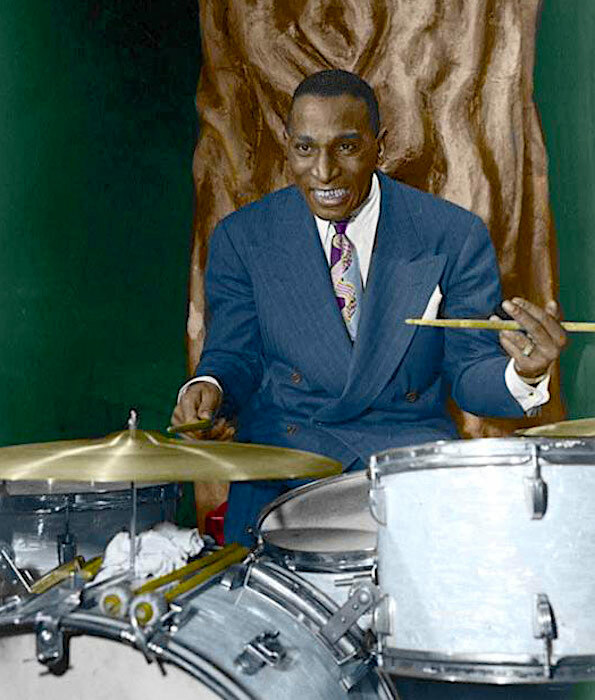 Not long after this, in 1953, he opened ‘The Krupa and Cole Drum School’ with his great friend Gene. 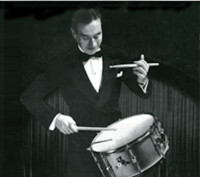 Cozy was unusual for a drummer of his era in that in the mid fifties he actually appeared briefly in two Hollywood films depicting completely different styles of music: ‘The Glen Miller Story’ in 1954 with James Stewart, June Allyson and Gene Krupa and ‘Don’t Knock The Rock’ in 1956. The second film (when swing drumming was becoming assimilated into the mainstream) starred Bill Haley, Little Richard and The Treniers. Two years later he scored a Number 1 hit on the Billboard ‘Hot 100′, along with a number three on the Cashbox charts. The record was called ‘Topsy Part 2’ and had a long drum solo. As this was a jazz record in what was ostensibly the pop music charts, this was highly unusual (especially as it was way before Sandy Nelson’s ‘Teen Beat’). I hadn’t listened to it properly since the sixties when, like many other teenage drummers I was captured by what he was playing without really understanding exactly what was going on from a technical standpoint. The record sold a million and was actually a more drum orientated version of a tune which had already been a hit for Count Basie in 1937, and Benny Goodman a year later. Cozy was famous for being able to play in any style and at the same time as this he evidently got calls for rock ‘n’ roll sessions including one for a song called ‘Nothin Shakin’ by a guy called Eddie Fontaine. This song was covered by The Beatles on their ‘Live At The Star Club’ album. Cozy Cole also made his own albums of songs with titles like ‘It’s A Rocking Thing’ with old tunes like ‘Organ Grinders’ Swing’ (popularised by Jimmy Smith in 1965) and even Jerry Lee Lewis’ ‘Whole Lotta Shakin’ Going On’. 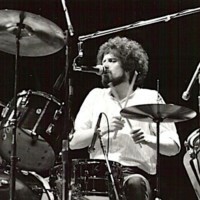 Photos show Cozy with Slingerland ‘Radio King’ drums, although he also played Leedy in the fifties with a pair of 12 x 8” toms, a 22 x 14” bass, 16 x 18” and 16 x 20” toms with a 14 x 5” snare drum. 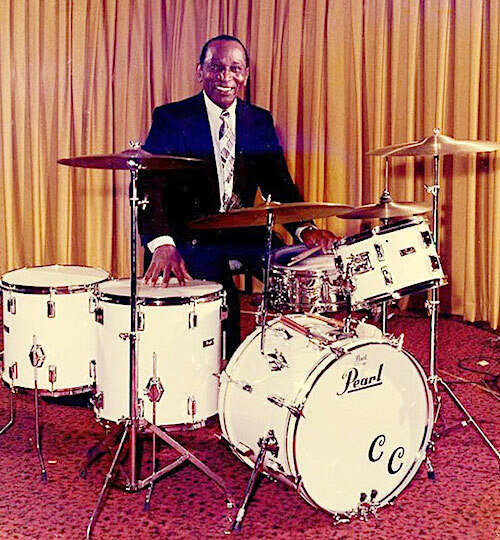 In 1960 he moved to Rogers and had a kit named for him with 12 x 8”, 13 x 9” and two 16 x 16” floor toms one of which (on his right) was borrowed from a Park Lane cocktail kit and had a foot pedal hitting underneath. The other floor tom had the 13 x 9” attached to it with a ‘Swivo-Matic’ holder. 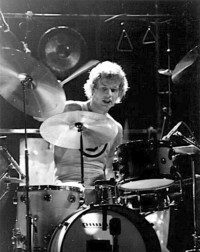 He’s also known to have played Pearl towards the end of his drumming career. 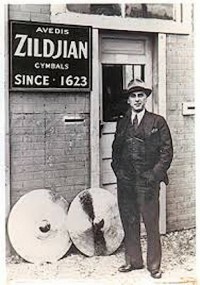 As far as I can ascertain he was a Zildjian player all his life. He was awarded an honorary degree by Columbus’ Capital University in 1978 where he lectured. Cozy Cole died of cancer on January 9th1981 in Columbus, Ohio.